This five row diamond ring is crafted in polished 14K white, rose, and yellow gold. 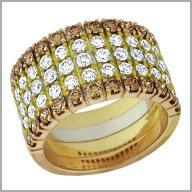 It features various round cut diamonds in prong settings, including: 24 chocolate, 24 yellow and 12 white. They glisten intently as they complement the setting color. If you're looking to stand out with a distinctive style, this ring is for you. The total diamond weight is approximately 2.52ct with a color of G-H and a clarity of SI. The setting size is 7/16" x 3/4" with a height of 1/16". Talk about a stunning band ring with (3) different colors of diamonds...this is the one you want to put on your finger again, and again, and again. I love mine and if you've had your eye on this one I would not hesitate to order one as you will not be sorry. Very classy and the diamonds sparkle like crazy! Treat yourself to a very different kind of band ring that will go with all your other Sonia designs. 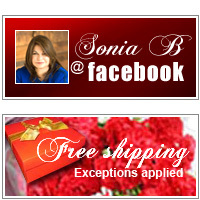 Thanks Sonia!